Chi Nguyen, a Ph.D. student in RIT’s astrophysical sciences and technology program, won a NASA Earth and Space Science Fellowship. She is collaborating on a Caltech-led experiment to measure light from the early universe. 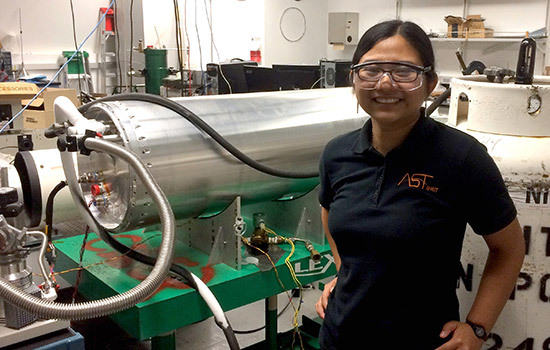 Nguyen is shown here with the Cosmic Infrared Background ExpeRiment 2 at Caltech. The NASA fellowship carries a $45,000 award, including a student stipend and funding for student- and university expenses. It will support Nguyen’s continued research investigating how astronomical structures like galaxies and stars formed after the Big Bang. Nguyen and Michael Zemcov, assistant professor in RIT’s School of Physics and Astronomy, use an observational technique known as intensity mapping to build a picture of astronomical objects in the early universe. Distribution and size of structures can be inferred by studying fluctuations of light and multiwavelength data in the cosmic infrared background—the historical record of light from ancient stars and galaxies that makes up a portion of all the light in the universe. “Because intensity mapping uses the ensemble of light from all galaxies [extragalactic background light], rather than individual ones, this technique is faster than source surveys—where you have to search and count every galaxy—and is more powerful at detecting very faint signals at large distances,” Nguyen said. Nguyen and Zemcov are members of RIT’s Center for Detectors and the Future Photon Initiative. Through their collaboration, Nguyen spent the summer at Caltech working on the Cosmic Infrared Background ExpeRiment 2. Zemcov is a co-PI of the Caltech-led CIBER-2 project. The experiment measures light in the cosmic infrared background from a rocket launched above the Earth’s atmosphere. Short flights in a sounding rocket allow the CIBER 2 instruments—a small telescope and multiple near-infrared cameras—to collect information unobscured by the atmosphere’s brightness. This includes a forward suspension system that connects the telescope and optics to the rocket skin and a system to filter out unwanted thermal light during lab tests, she said. The NASA Earth and Space Science Fellowship focuses on the four research programs of the Science Mission Directorate: astrophysics, earth science, heliophysics and planetary science. The four science divisions received a total of 764 applications this year. The fellowship program is designed to ensure continued training of a highly skilled workforce in disciplines specific to NASA’s objectives.